Spain was caught up in some extreme weather this week, which saw the north-western part hit by unusually early snow, the north-eastern part hit by strong winds (which caused a harbour accident in Barcelona) and a freak tornado hit its Mediterranean isles (which left many without electricity for days on end). 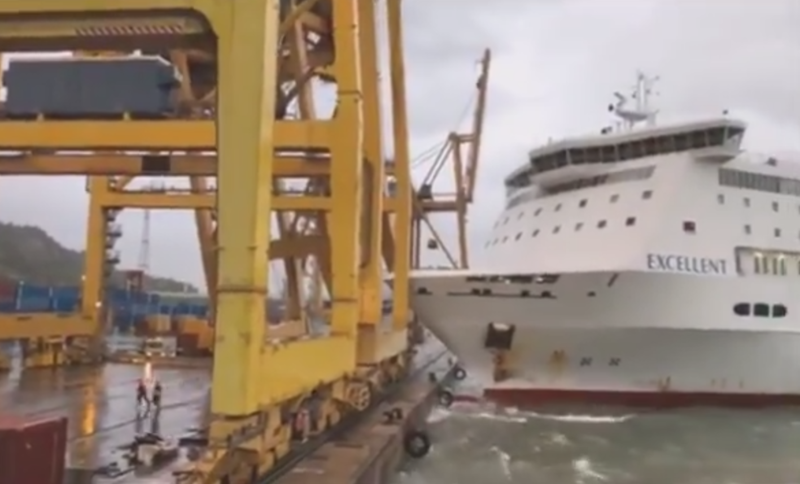 Video footage from inside the Barcelona harbour shows how a huge crane crashes to the ground after being hit by an out-of-control ferry and then catches fire. Luckily no one was hurt in the accident. The ferry (called Excellent operated by Italian firm Grandi Navi Veloci) carried about 420 passengers and got caught in strong winds as it was trying to leave the harbour. The collision caused an out of control fire which resulted in firefighters having to evacuate the area. Authorities confirmed no injuries, although two people are said to have been treated by medics after suffering a panic attack. The ship was heading for Tangier, Morocco. Early October snow fell in the northern provinces of Galicia, Asturias and Cantabria. All roads leading to the city of Santander had to be closed off for a few days beginning of this week, which is unusually early for the time of year. Heavy snowfall and plummeting temperatures all across the north of the country led to traffic chaos on Spain’s train networks and roads. It was caused by a gust of polar air lingering over the Iberian peninsula. On the Mediterranean Spanish island Menorca some 2,000 tourists had to be evacuated after a freak tornado visited, tearing down electricity poles and leaving 38,000 without power. Three quarters of the island was left without power for 3 days this week. REAL REASON behind MANCHESTER BOMBING????????????????????????? ?